Optical biosensor techniques can detect changes in mass near the plasma membrane in living cells and allow one to follow cellular responses in both individual cells and populations of cells. This protocol will describe detection of the modulation of potassium channels by G-protein coupled receptors in intact cells using this approach. Fleming, M. R., Shamah, S. M., Kaczmarek, L. K. Use of Label-free Optical Biosensors to Detect Modulation of Potassium Channels by G-protein Coupled Receptors. J. Vis. Exp. (84), e51307, doi:10.3791/51307 (2014). Ion channels control the electrical properties of neurons and other excitable cell types by selectively allowing ions to flow through the plasma membrane1. To regulate neuronal excitability, the biophysical properties of ion channels are modified by signaling proteins and molecules, which often bind to the channels themselves to form a heteromeric channel complex2,3. Traditional assays examining the interaction between channels and regulatory proteins require exogenous labels that can potentially alter the protein's behavior and decrease the physiological relevance of the target, while providing little information on the time course of interactions in living cells. Optical biosensors, such as the X-BODY Biosciences BIND Scanner system, use a novel label-free technology, resonance wavelength grating (RWG) optical biosensors, to detect changes in resonant reflected light near the biosensor. This assay allows the detection of the relative change in mass within the bottom portion of living cells adherent to the biosensor surface resulting from ligand induced changes in cell adhesion and spreading, toxicity, proliferation, and changes in protein-protein interactions near the plasma membrane. RWG optical biosensors have been used to detect changes in mass near the plasma membrane of cells following activation of G protein-coupled receptors (GPCRs), receptor tyrosine kinases, and other cell surface receptors. Ligand-induced changes in ion channel-protein interactions can also be studied using this assay. In this paper, we will describe the experimental procedure used to detect the modulation of Slack-B sodium-activated potassium (KNa) channels by GPCRs. Examining living cells in their physiologically relevant context is crucial to understanding the biological functions of cellular targets. However, assays examining the interaction between channels and regulatory cytoplasmic proteins, such as coimmunoprecipitation assays, generally provide little information on the time course of interactions in living cells. The majority of current cell based assays measure a specific cellular event, such as the translocation of a fluorescently tagged protein of interest. These assays require modifications of the proteins of interest, which can potentially alter the protein's behavior and decrease the physiological relevance of the target. Noninvasive cell based assays, which do not require manipulation of the system, provide a continuous measurement of cellular activity and allow studies of cells in their most physiologically relevant state4. Optical biosensors are designed to produce a measureable change in a characteristic of the light that is coupled to the sensor surface. Optical biosensors that utilize evanescent waves, which include surface plasmon resonance (SPR) and resonance wavelength grating (RWG) techniques, have been primarily used to detect the affinities and kinetics of molecules binding to their biological receptors immobilized on the sensor surface. More recently, commercially available RWG biosensors have been developed to allow the detection of the relative change in mass within the bottom portion of cells adherent to the sensor surface at high spatial resolution (up to 3.75 µm/pixel)5. These biosensors can detect changes in mass near the plasma membrane of living cells that result from stimulation, such as cell adhesion and spreading, toxicity, proliferation and signaling pathways elicited by a variety of cell surface receptors including G-protein coupled receptors (GPCRs)6. RWG biosensors detect the relative change in the index of refraction as a function of the relative change in mass within 150 nm of the biosensor7. When cells are plated to the biosensor, this change in the index of refraction reflects the change in mass near the plasma membrane of the cell resulting from a change in cellular adherence to the biosensor. This protocol will discuss the detection of channel-protein interactions using RWG biosensors. RWG data acquisition systems consist of several components. Because the X-BODY Biosciences BIND Scanner was used for these experiments, we shall refer to the components for this particular system, which consists of a plate reader, associated biosensors, BIND Scan acquisition software, and BIND View analysis software8. The photonic crystal biosensors, referred to hereafter as optical biosensors, are composed of a periodic arrangement of a dielectric and material in 2 or 3 dimensions which prevents the propagation of light at specific wavelengths and directions. Photonic crystal structures are based on a phenomenon called Wood's anomaly. First discovered by Wood in 1902, these anomalies are effects observed in the spectrum of light reflected by optical diffraction gratings where rapid variations in the intensity of particular diffraction orders occur in certain narrow frequency bands. In 1962, Hessel and Oliner presented a new theory of Wood's anomalies in which finite period grating generates a standing resonance wavelength9. In the optical biosensors described here, Wood's anomalies are used to produce a RWG biosensor that when stimulated with white light reflects only very narrow band of wavelengths (typically between 850-855 nm). Individual biosensors consist of a low-refractive index plastic material with a periodic surface structure which is coated with a thin layer of the high-refractive dielectric material titanium dioxide (TiO2). When the biosensor is illuminated with a broad wavelength light source, the optical grating of photonic crystals reflects a narrow range of wavelengths of light which is measured by a spectrophotometer in the BIND Scanner. The peak intensity of the reflected wavelengths (Peak Wavelength Value, or PWV) is then calculated from the signal. The PWV of light shifts upon a change in the index of refraction as a result of an increase or decrease in mass within the proximity (~150 nm) of the biosensor surface. Optical biosensors are incorporated into a standard Society for Biomolecular Sciences (SBS) 384-well microplate for the assays used in these experiments. RWV biosensors are used to detect changes upon addition of exogenous signals in living cells10. Cells are directly cultured onto the surface of a RWG biosensor and the change in the local index of refraction is monitored upon treatment with specific stimuli. The direction of change in mass at the biosensor can be determined, because an increase in the local index of refraction results from an increase in mass near the biosensor and is measured as an increase in PWV. Conversely a decrease in mass produces a decrease in PWV. The change in detected PWV can result from numerous cellular events, including changes in cell adhesion, protein recruitment/release, endocytosis and recycling, exocytosis, apoptosis, and cytoskeletal rearrangement. For example, the assay can be detect changes in channel-protein interactions between potassium channels and other cytoplasmic or cytoskeletal components. The event, however, must occur within the ~150 nm detection zone near the biosensor, and in the case of an attached cell, near the plasma membrane. Acquisition of cellular responses is performed with BIND Scan software and an image representation of each of the 384 wells in the SBS plate is generated. This system has a resolution of up to 3.75 µm/pixel, allowing detection of events in single cells, and can be used either with cell lines (such as HEK293 or CHO cells) or with more physiologically relevant primary cells. Image analysis with BIND View software allows the detection of cellular responses in both individual and populations of cells. As the biosensors are incorporated into standard SBS 384-well microplates, the system is readily adaptable to high-throughput screening (HTS). Resonance-wavelength grating optical biosensors have previously been used to detect changes in mass near the plasma membrane of cells following activation of GPCRs11. Our laboratory has cloned two sodium-activated (KNa) potassium channels, Slack-B and Slick12. The activity of both Slack-B and Slick channels has been shown to be very strongly influenced by direct activation of protein kinase C (PKC)13. Activation of Gαq protein coupled receptors, such as the M1 muscarinic receptor and the mGluR1 metabotropic glutamate receptor, potently regulates channel activity through PKC activation. These KNa channels contribute to neuronal adaptation during sustained stimulation and regulate the accuracy of timing of action potentials14. Slack channels are known to interact with a variety of cytoplasmic signaling molecules, including FMRP, the Fragile X Mental Retardation protein15,16. Mutations in Slack result in Multiple Migrating Partial Seizures of Infancy (MMPSI), an early onset form of epilepsy which results in severe developmental delay17. Culture cells in appropriate media for greater than 2 but less than 10 passages before use in this assay. Untransfected HEK-293 cells and HEK-293 cells stably expressing rat Slack-B protein are grown in one half Dulbecco's Modified Eagle medium and one half Leibovitz's L-15 Medium supplemented with 10% heat inactivated fetal bovine serum and antibiotics. 500 µg/ml Geneticin (G418) is added to HEK-293 cells stably expressing Slack-B to select for expression of the Slack channel. Passage cells at 70-90% confluence by dissociation from dishes with a 0.25% trypsin-EDTA solution. Prepare a working solution of fibronectin in phosphate buffered saline (PBS) with a final concentration of 5 µg/ml of fibronectin in 20.0 ml PBS. From a 1.0 mg/ml stock concentration, add 100 µl to 20.0 ml PBS for a 200-fold dilution. The working solution of fibronectin can be aliquoted and stored at -20 °C after preparation. Prepare a 5% stock solution of heat-inactivated ovalbumin in sterile water. Dilute ovalbumin in sterile tissue culture grade water for a 5% solution and heat-inactivate for 30 min at 60 °C. Cool the solution to room temperature and sterile filter the solution. Aliquot the 5% ovalbumin solution and store at 4 °C. Prepare a 2% working solution of ovalbumin by diluting the 5% stock solution into PBS. For example, add 12.0 ml of 5% ovalbumin stock solution to 18.0 ml of PBS for a final volume of 30.0 ml. Hydrate the TiO2 plate with 20.0 µl/well of sterile tissue culture grade water for 15 min. The following steps should be performed with a 16-channel pipettor. Wash plate 1x with 50.0 µl PBS per well. Add 20.0 µl of the fibronectin working solution to each well and incubate for 2 hr at room temperature to create the ECM. Add 40.0 µl of the ovalbumin working solution to each well and incubate overnight at 4 °C to block the plate. Wash plate 3x with 50.0 µl PBS per well. ECM coated plates can be stored at 4 °C for up to 48 hr. Remove growth media from the cells and add trypsin to dislodge the cells from the plate. Collect the cells and centrifuge at 1,000 x g for 1 min. Remove the trypsin media and resuspend cells in growth media. Using a hemocytometer or an automated cell counter, determine the concentration of the cells. To minimize the effects of evaporation during incubation, 50.0 µl of growth medium per well will be used. Cells should be diluted to achieve the desired number of cells per well in a volume of 50.0 µl of growth medium. For these experiments, 1,000 cells/well were plated onto the biosensor. Allow the seeded cells to incubate overnight in growth medium at 37 °C under air/5% CO2. Remove the plate from the incubator and remove growth media from the cells. Wash the cells 1x with Hanks Balanced Salt Solution (HBSS). Add 25.0 µl of HBSS to each well. Place the biosensor plate on the BIND Scanner and allow the cells to equilibrate to room temperature for 1-2 hr. Prepare a separate compound plate from which ligands of interest will be added to the biosensor plate during the assay. For these assays, 25.0 µl of solution containing compound was added to each well on the biosensor plate for a total volume of 50.0 µl. As such, compounds in solution were prepared in 2x the desired final concentration. Take a baseline measurement with the Scanner system for wells A1-P12 (half of the SBS 384-well plate) using a maximum resolution of 3.75 µm/pixel for the central 1.5 mm of each well using the BIND Scan software . This baseline scan will take approximately 30 min. Add 25.0 µl of the compound solutions to each well for wells A1-P12. Take a baseline measurement of wells A13-P24. Add 25.0 µl of the compound solutions to each well for wells A13-P24. Take a post compound addition measurement for wells A1-P12, and repeat for wells A13-P24. Open the BIND assay data for the baseline measurement in Windows, and click the "Grid Editor" button to enable cell selection. The software will calculate metrics of interest defined by the user. Open the "Plug-ins", which include the "Cell Finder" and "Baseliner" function. Set parameters in "Cell Finder" so that cells are distinguishable from the background of the biosensor. Export the cell map file which contains the "Cell Finder" data for the baseline measurement. Repeat steps 6.1-6.2 for post compound addition data. Open the "Baseliner" plug-in and import the cell map from the baseline measurement. The software will calculate the shift in PWV between the background and post compound data. Select "Δ Cell Mean" for the output of the mean shift in PWV for cells. The data can then be exported to Microsoft Excel for further analysis. Slack-B stably transfected HEK-293 cells and control untransfected HEK-293 cells were seeded at 1,000 cells/well on 384-well, ECM coated RWG biosensor plates. Images from the central 1.5 mm2 of the biosensor were recorded at a resolution of 3.75 µm/pixel (Figure 1). Density gradient maps of mass were generated pre and 30 min post compound addition with the BIND Scan software. The BIND View software was utilized to determine the shift in PWV upon GPCR agonist addition by subtracting the PWV post compound addition from the baseline PWV. The endogenous M1 muscarinic receptor agonist carbamoylcholine chloride (carbachol)19 was applied to both untransfected control HEK-293 and rat Slack-B stably expressing HEK-293 cells resulted in a positive increase in PWV (Figure 2A). Measurements were taken at 30 min and signals were normalized to buffer only (HBSS) addition. Compared to the control cells, the Slack-B transfected cells had a greater increase in peak shift in PWV. SFLLR-NH2 trifluoroacetate salt (SFLLR), an N-terminal TRAP pentapeptide which exhibits agonist activity against the endogenous GPCR protease activated receptor 1 (PAR1), also showed differential responses in untransfected and Slack-B transfected cells (Figure 2B). These results show the presence of the Slack-B channel significantly increases the shift in PWV that occurs upon activation of endogenous GPCRs in HEK cells, and demonstrate the feasibility of using this assay to study channel-protein interactions. Figure 1. Analysis of Cellular Responses in BIND View. Representative images of BINDScanner data for Slack-B stably transfected HEK-293 cells A) before and B) after image analysis with the BIND View software "Cell Finder" plug-in. Thresholds were manually set utilizing the "Cell Finder" plug-in to identify cells from background. B) Areas shown in red in represent pixels identified as belonging to cells and yellow lines distinguish cells from the gray plate background. C) The shift in PWV for cells upon SFLLR addition is shown by a color gradient, where red represents a positive shift in PWV and blue represents no change. The scale bar represents 100 µm. Click here to view larger image. Figure 2. Expression of Slack-B alters the shift in PWV following activation of GPCRs. A) The M1 muscarinic receptor agonist carbachol (500 µM) produced a shift in PWV that is greater in amplitude in Slack-B transfected cells than control HEK-293 cells (P < 0.0001, N = 16 wells/condition). B) Application of SFLLR (10 µM), an N-terminal TRAP pentapeptide that exhibits agonist activity against the GPCR endogenous protease activated receptor 1 (PAR1), produced a shift in PWV response that is greater in amplitude in Slack-B-transfected cells than in control HEK-293 cells (P < 0.0001, N = 16 wells/condition). Measurements were recorded 30 min post compound addition, and ligand response was normalized to buffer only control. Error bars are ± SEM. Click here to view larger image. The Z prime (Z') factor is a common statistical method to quantify the quality of a high-throughput screening assay20, and because the screening of the GPCR agonists in this assay occurred in a SBS compatible 384-well assay, provides an excellent measure of the robustness and validity of this assay21. A Z' value of 1 indicates a theoretically ideal assay with an infinite number of data points with nonexistent standard deviations. A Z' value of between 0.5-1 is considered an excellent assay for high-throughput screening purposes, with below 0.5 considered a marginally informative assay. For this data set, the calculated Z' value utilizing carbachol an SFLLR as positive controls is 0.79 and 0.81 respectively, indicating this assay is highly robust and the results obtained are highly significant. Extracellular matrix coating of the 384-well optical biosensor plate, cell seeding, and compound addition in these experiments was performed manually with a 16-channel Finnpipette (5-50 µl). As this assay is performed on a SBS plate, more advanced robotic liquid handling systems can be used in high throughput screening. However, when adapting the systems for liquid handling instrumentation, care should be exercised to ensure that pipette tips do not touch the biosensor surface as this will cause damage to the biosensor. When adding compounds dissolved in DMSO, the assay must be performed so that the final concentration of DMSO in assay media is held constant to avoid a shift in PWV due to DMSO toxicity to the cell ("DMSO shock"). Although different cell lines are differentially responsive to DMSO in this assay, we recommend that the final concentration of DMSO not exceed 0.1-0.2% by volume. Cells should be incubated in the final concentration of DMSO in assay buffer during the temperature equilibration step of this protocol in order to avoid solvent-induced shifts in PWV. A diverse range of cells, including primary cells, may be studied with this assay, although optimization of the assay for each cell line must be performed. When using different cell types, optimization of the number of cells and extracellular matrix biosensor surface coatings should be performed. Cells should be seeded at various densities between 1,000-15,000 cells/well and treated with a known receptor agonist to determine which density produces the highest Z'. 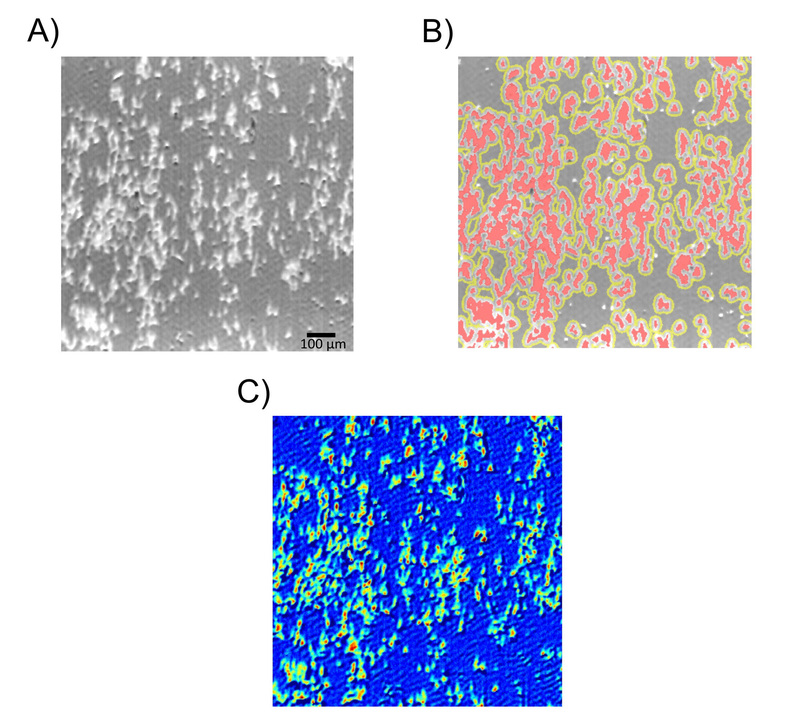 Various ECM surface coatings, including but not limited to fibronectin, collagen, and laminin, either alone or in combination, should be tested for ensure that cells remain adherent to the biosensor during the assay. Cell starvation (lack of serum) may influence cellular response in this assay, and as such experiments may be performed in serum-free and serum-containing media for initial assay optimization purposes. The high resolution of the BIND Scanner's label free detection enables response measurements to be quantified at low cellular density, since the analysis of cellular responses can be restricted to only those pixels contacted by cells. In addition, subpopulations of cells within a heterogeneous mix can be gated based on multiple parameters (including size and strength of cell adhesion) and measured for individual cellular responses. Taken together, these capabilities make the BIND Scanner ideal for assays involving primary cultured cells. The BIND Scanner system allows measurements to be taken over a specified time-course, and therefore time-lapse measurements of changes in PWV can be recorded. This is particularly useful for measuring changes in cell behavior that occur over longer time periods than those due to channel-protein interactions, including cell proliferation, cell division, and cell migration. The BIND View software allows for analysis of such cellular responses, and can quantify numerous parameters of changes in cell structure, including changes in cell adherence, changes in cell volume, and changes in cell movement, allowing both quantitative analysis and time-lapse imaging of these events. For example, this system may be used to determine the rate which fibroblasts respond to growth factor signaling by tracking the rate of cell migration across an individual well. Steven M. Shamah is an employee of X-BODY Biosciences. The authors are grateful to Dr. Yangyang Yan in the laboratory of Dr. Fred Sigworth at Yale University for the generous donation of HEK293 cells stably expressing rat Slack-B protein. Additionally the authors are grateful to Dr. Sigworth for cryo-electron microscopy homology model of Slack displayed in the video introduction. This research was supported by NIH Grants DH067517 and NS073943 to L.K.K. Hille, B. Ion Channels of Excitable Membranes. Sinauer Associates. (1992). Kaczmarek, L. K. Non-conducting functions of voltage-gated ion channels. Nat. Rev. Neurosci. 7, 761-771 (2006). Levitan, I. B. Signaling protein complexes associated with neuronal ion channels. Nat. Neurosci. 9, 305-310 (2006). Shamah, S. M., Cunningham, B. T. Label-free cell-based assays using photonic crystal optical biosensors. Analyst. 136, 1090-1102 (2011). Cunningham, B. T., Laing, L. M. icroplate-based label-free detection of biomolecular interactions: applications in proteomics. Expert Rev. Proteomics. 3, 271-281 (2006). Peters, M. F., Vaillancourt, F., Heroux, M., Valiquette, M., Scott, C. W. Comparing label-free biosensors for pharmacological screening with cell-based functional assays. Assay Drug Dev. 8, 219-227 (2010). Fang, Y., Ferrie, A. M., Fontaine, N. H., Mauro, J., Balakrishnan, J. Resonant waveguide grating biosensor for living cell sensing. Biophys. J. 91, 1925-1940 (2006). Cunningham, B. T., et al. Label-free assays on the BIND system. J. Biomol. Screen. 9, 481-490 (2004). Hessel, A. aO., A, A. A New Theory of Wood's Anomalies on Optical Gratings. Appl. Optics. 4, 1275-1297 (1965). Cunningham, B. T., Laing, L. G. Advantages and application of label-free detection assays in drug screening. Expert Opin. Drug Discov. 3, 891-901 (2008). Lee, P. H. Label-free optical biosensor: a tool for G protein-coupled receptors pharmacology profiling and inverse agonists identification. J. Recept. Signal Transduct. Res. 29, 146-153 (2009). Bhattacharjee, A., Kaczmarek, L. K. For K+ channels, Na+ is the new Ca2. Trends Neurosci. 28, 422-428 (2005). Santi, C. M., et al. Opposite regulation of Slick and Slack K+ channels by neuromodulators. J. Neurosci. 26, 5059-5068 (2006). Yang, B., Desai, R., Kaczmarek, L. K. Slack and Slick K(Na) channels regulate the accuracy of timing of auditory neurons. J. Neurosci. 27, 2617-2627 (2007). Brown, M. R., et al. Fragile X mental retardation protein controls gating of the sodium-activated potassium channel. 13, 819-821 (2010). Zhang, Y., et al. Regulation of neuronal excitability by interaction of fragile X mental retardation protein with slack potassium channels. J. Neurosci. 32, 15318-15327 (2012). Barcia, G., et al. De novo gain-of-function KCNT1 channel mutations cause malignant migrating partial seizures of infancy. Nat. Genet. 44, 1255-1259 (2012). Fleming, M. R., Kaczmarek, L. K. Use of optical biosensors to detect modulation of Slack potassium channels by G protein-coupled receptors. J. Recept. Signal Transduct. Res. 29, 173-181 (2009). Nelson, C. D., et al. Targeting of diacylglycerol degradation to M1 muscarinic receptors by beta-arrestins. Science. 315, 663-666 (2007). Zhang, J. H. A Simple Statistical Parameter for Use in Evaluation and Validation of High Throughput Screening Assays. J. Biomol. Screen. 4, 67-73 (1999). Gribbon, P., et al. Evaluating real-life high-throughput screening data. J. Biomol. Screen. 10, 99-107 (2005).